Wade's heroic knock went in vain. 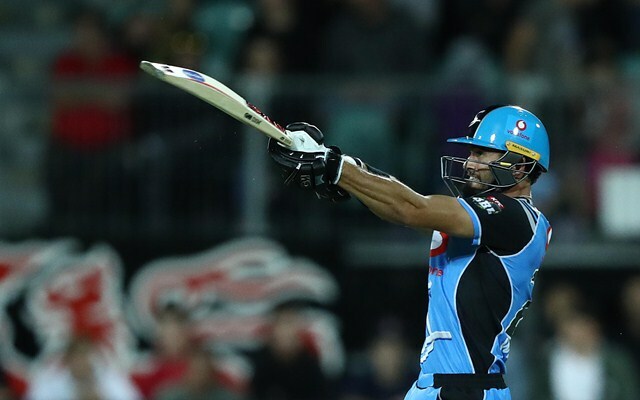 The defending champions Adelaide Strikers stamped their authority probably for the first time this season. They brought their best batting out against the top side Hobart Hurricanes at the Aurora Stadium in Launceston. With this victory, they are still at the sixth position in the points table after 12 matches and will need to win both their remaining matches. Moreover, the Strikers will also need some results to go their way in the last leg of the season. D’Arcy Short and Matthew Wade continued to torment the opposition bowlers again after the Hurricanes were made to bat first. Both added 59 runs for the first wicket in less than seven overs after which the former was dismissed by Ben Laughlin. However, Wade’s purple patch continued as hit the ball cleanly. Caleb Jewell and Ben McDermott played him second foil in 55 and 36-run partnerships. Wade took a liking to every bowler in the opposition ranks and reached the 80-run in the 15th over itself. There was a century for taking for the Hurricanes skipper. But his innings was cut short on 88by Laughlin in the 18th over after which the table toppers endured a collapse and they didn’t get the finishing kick in the end on a flat pitch. Eventually, the Hurricanes finished on 169/7 threatening to cross the 180-run mark at one stage when Wade was batting. Hobart Hurricanes have rested a few players after qualifying for the knockouts and that has clearly affected their bowling. Jarrod Freeman was taken for 17 runs in the second over of the innings and that began the assault. In no time, the scorecard read 63 after a mere three overs and the game had ended there itself. Alex Carey and Jake Weatherald had fun in the powerplay and then played cautious cricket to put the team in the winning position. They added 116 runs in 10.4 overs together and despite the former’s wicket, Weatherald continued to score runs. While Carey scored 54 off 36, his partner was more brutal in smashing 82 off just 42 deliveries with 11 fours and a couple of sixes. Though a total of three wickets fell in the end, they were always ahead in the chase and the Strikers closed the game in the 18th over itself to stay alive in the tournament. At the very least, Matthew Wade should be on the plane to India for upcoming Twenty20 tour. Having said that, it would mean less Shield cricket for him. The eternal bind.